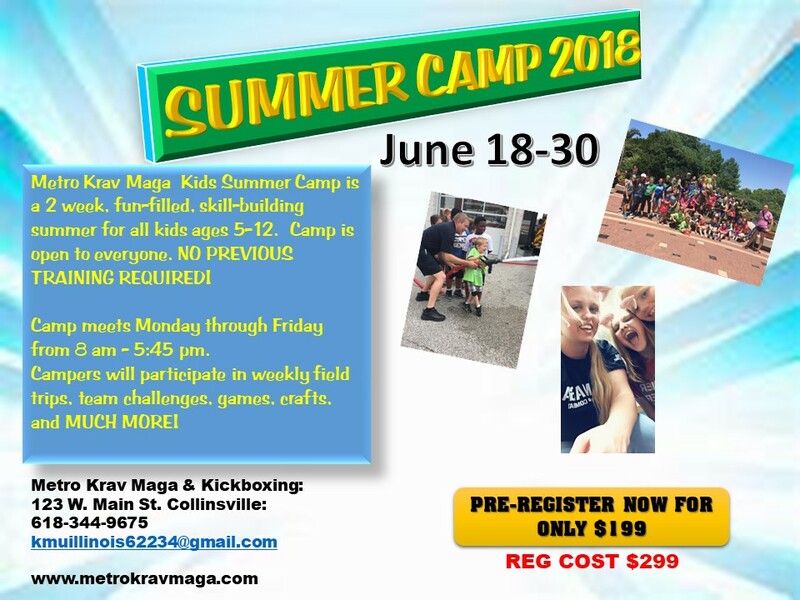 Metro Krav Maga & Kickboxing Summer Martial Arts Camp is a 2 weeks of fun-filled, skill-building activities for all kids ages 5-12. Camp is open to everyone; no previous training is required. It is once again time for our 18th annual SUMMER CAMP!!! We have a FUN 2 weeks martial arts camp; allowing kids to experience a fun, action packed camp experience; while still allowing parents to enjoy summer activities with their children. The official start of camp is June 18th and will end June 30th. Cost for the Camp is only $299.00 for the 2 week session. However you may Pre-Register BEFORE BY MARCH 15TH FOR ONLY $199.00! That’s cheaper than day care centers and A LOT MORE FUN!!! This price includes all field trips, parties, etc. Due to state regulations, we are not permitted to serve lunch. Therefore, all camp attendees must bring a sack lunch Monday through Thursday. Fridays will be our Pizza Party day. We will provide juice at lunchtime and snack time. We will also provide cups for water from the faucet. Camp attendees may bring any other drinks or they may purchase drinks from our machine. What will we do at Martial Arts Camp? In short…..WE WILL HAVE A BLAST!!!!! Your kids will get to participate in Martial Arts classes, games, learn new arts, go on picnics & field trips, and participate in our summertime Bully Proof & Kid Safe Programs. Activities during camp will include one martial arts class per day. Since Camp Kids (Under Black Belt Ranks) will take class during camp hours; you will have the freedom to engage in evening time family activities, without the worry of falling behind. 2:00pm to 2:30pm = TEAM CHALLENGE TIME! 4:00pm to 5:45pm = Regular Martial Arts Classes Begin / Movie Time / Organized Free Time. PLEASE NOTE: This is only a sample schedule. Every Friday we will have Field Trip Day and Pizza Party. On this day; We will not have a Martial Arts Class. Sign up early so you don’t miss out on all the fun! Register early.